How does buying a home with Carriage House Real Estate work? When buying a home with Carriage House Real Estate, we make it as easy as possible. First, expect to sign a buyer’s broker agreement with a Carriage House Real Estate Agent in the geographic area that you are interested in finding a home in. This creates a relationship between you and the agent and explains the agent’s duties to you, and vice versa. This will not only create a fiduciary responsibility to you but mandate a responsibility of loyalty to you in any transaction that you enter into. Let your agent know how you want him/her to communicate with you and how often. Do you want phone calls, emails, text messages, IMs or all of the above? Your agent will have you pre-approved with the Carriage House Real Estate preferred lender in order to determine how much house you can afford and what your price range and monthly payments should be. Set realistic goals such as home size, bedrooms, style of home, essential rooms/floor plan elements (such as a great room or a family and living room) lot size, etc. and a time frame to find your home. Ask your agent how you can help by supplying feedback. If you expect your agent to pick you up at your front door and drive you home after showing homes, tell him/her. Otherwise, you will be asked to meet at the office or a mutually convenient location. Do not feel silly for asking your Carriage House Real Estate Agent to explain a form to you. It’s his/her job. Many forms are second nature to agents but not to you, so ask for explanations until you are satisfied you understand. Realize agents are not lawyers and cannot interpret the law. Don’t ask agents to give a legal opinion. Bring your checkbook. You’ll need it to write an offer because an earnest money deposit will be required to accompany your purchase offer. 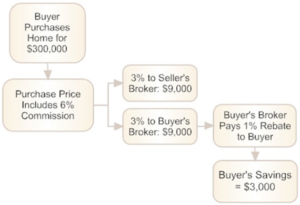 How does the 1% Buyer Rebate program work? Some real estate brokers offer consumers cash refunds or non-cash incentives to encourage them to use that broker’s services. Rebates are typically cash payments from the real estate broker to his or her client after closing. Incentives may include gift certificates, closing-cost payments, or free ancillary services such as home inspections or moving services. Rebates can save consumers several thousand dollars in a single transaction. For example, if a broker offers to rebate 1% to the homebuyer, the average buyer of a $300,000 home could save $2,500 to $3,000 (based on the 2.5% to 3% commission rates typically earned by the buyer’s broker). Incentives, such as gift certificates for a home inspection, merchandise at a nearby hardware store, or moving services, or a credit towards closing costs give consumers monetary benefits from the transaction that they otherwise would not have obtained. Source: The United States Department of Justice. I’m a first-time home buyer, what do I need to buy a home? You will need to do your homework. Understand contingencies, home inspections, appraisals, etc. How much does it cost to list with Carriage House Real Estate? It costs 1 percent to list with Carriage House Real Estate. Click Selling Homes for more information. How does the 1% listing fee work? To see how the 1% listing fee works, click here. Why list with Carriage House Real Estate? We’ve been selling homes for years, so we can make selling your home as pain-free as possible. Our team provides education and experience, deep knowledge of the neighborhoods, price guidance, and market conditions. Plus, our agents network with other professionals, many of whom provide services that you will need to sell. So, we can give you a list of references with whom Carriage House Real Estate Agents have worked with and provide background information to help you make a wise selection. Part of our job is to negotiate and get you the best deal. Our agents are trained to present their client’s case in the best light and agree to hold client information confidential from competing interests. In addition, we handle volumes of paperwork for you and help out with after-closing questions (i.e. tax assessments, doc stamps or transfer tax, invoices). Henry Ford once said that when you hire people who are smarter than you are, it proves you are smarter than they are. The trick is to find the right person. Listing with Carriage House Real Estate allows you to focus on your day-to-day while we focus on selling your home. And, we do all of this for our exclusive “one percent listing fee.” Click here for more information. Clean your home. Consider hiring a cleaning service to maintain cleaning if you don’t have time. Pay attention to smells. While bacon may smell good, it lingers for days and can leave a bad impression. You want the house to smell fresh, not a fast-food restaurant. Repaint the walls neutral colors. You may love your green wall, but potential buyers might not—and that will leave a lasting impression. Neutral colors allow potential buyers to look at the space, not the colors on the wall. Keep your decor simple and remove personal items. You want buyers to envision themselves in the home, not think about your family and personalities. Keep it simple. Let there be light and bring in nature. A bright, cheery room looks bigger and more inviting. And plants bring in more positive energy. Do a faux “renovation.” Little tweaks can make a big difference in the overall feel of a room. So fix the kitchen faucet or throw a slipcover over the used-looking couch. Draw buyers’ eyes towards any special features. A striking fern on the mantle can show off your fireplace. Spruce-up the front entrance. That first impression goes a long way. See our How to Finance page for more information. You’ll have to fill out a loan application and your loan officer will help you through every step of the way. Click here for more information. How do I find a loan officer? Our preferred lender is CMG Financial Retail Lending. Matthew Barba, Senior Loan Officer can help you during your home buying process. Click here for more information.